When do we feel like giving up on something we love to do just because we are not good at it? Do we move on to the next one because we feel like it’s not meant for us? There comes a time where we do something that we like and then eventually give up because we feel that we lack the talent to do it. Whether it’s painting, dancing, and cooking, we can master these things through constant and deliberate practice. For most of us, we can focus on one hobby and be great at it because we are motivated to practice. In my case, I have been playing the guitar since 2005, and a lot of my friends and relatives give me positive remarks about my playing, so I decided to keep on practicing and become great at playing the guitar, a new-found skill I used to serenade people. There is a saying that goes, “If you fail to practice your art, it will soon disappear.” It means that when we don’t practice our talents or passion, we forget how to do it, and we lose our progress and start to become bad at it. When I stopped playing the guitar because of my studies, for example, I slowly forgot how to play it, but since I am practicing again, I am becoming great again. Therefore, I’d like to share the three C’s in practice that would make us achieve our desired results. 1. CONSISTENCY is when you are able to practice gradually and continually. It is making sure that you follow through at the times you set aside to practice. It is not practice when you have the time; you must make the time. No excuses. 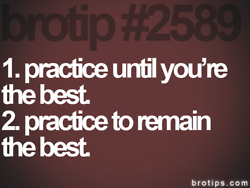 If you keep on practicing, you will eventually become one of the greatest. A lot of successful persons are great at their job because they practiced consistently. Michael Jordan, wasn’t always a great basketball player since he wasn’t even part of the high school varsity team and was not a top player in college, but through consistent practice, he eventually became one of the greatest basketball players ever. The best athletes, doctors, lawyers, actors, and managers cannot be where they are without consistency in practice. One of the things I have mastered is cooking Korean fried chicken, which can rival Bon Chon’s; it is a combination of sweet and tangy flavors, but with a dash of salty spice. In every family social gathering, whether it’s a birthday or an anniversary, everyone always asks for my specialty. It took me around 30 trials before I could perfect it, and it was my consistent trials or practice that led me to my own Korean fried chicken concoction. I was so obsessed about mastering that I actually tried cooking at least twice a week, and before I knew it, I was serving it at the many big family events. 2. CONFIDENCE. We look up to the people who are successful in their chosen career or hobby, but when it comes to ourselves, we move from hobby to hobby when we feel that we are not good at them. 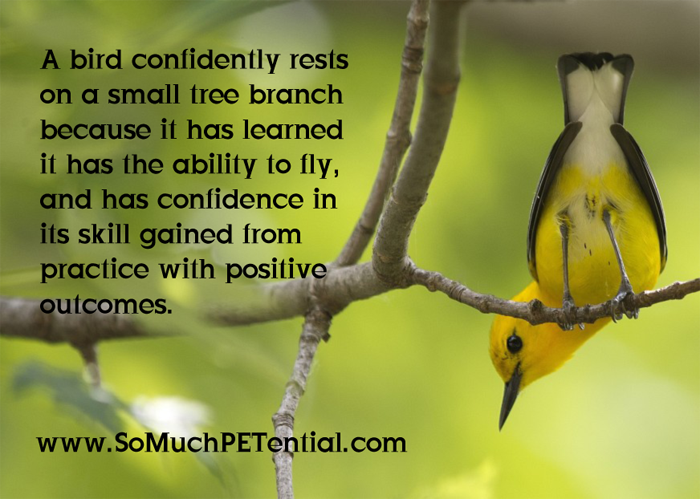 We tend to lose confidence in ourselves when things get difficult, and it is easier to move on to something else. Instead of giving up, we must do the opposite and become more confident than ever so that we can continue to gain improvement. It is at the toughest moment where we need our confidence the most. Lacking confidence would just make you quit practicing, and you eventually just quit altogether. I remember back in 2012, I was asked to perform at a birthday party with my band. I was really nervous because I wasn’t comfortable yet playing in front of an audience, and all of the attention was directed to us. It made me forget the chords, and I also forgot some of the lyrics. It was so embarrassing that I almost wanted to stop performing in public, but my close friends heard me singing and encouraged me to sing for them. Since I was confident about my singing, I didn’t mind performing for them. I relied on this confidence to get me to practice again. Instead of feeling down and quitting the band, I regained my confidence and continued to practice. 3. CHALLENGE. Practice doesn’t have to be constrained around hobbies and sports. Practice can also be an important aspect of improving our career and studies. Ask yourselves, why do we fail at things that should be easy for us? It is because we lack practice. We never learn from our mistakes, and we never aim high. We should always set to challenge ourselves, or aim for the the biggest prize. Instead of settling for less, we should settle for the best. There’s this quote that goes, ” Always aim for the moon; even if you miss, you’ll land among the stars.” It means that when you challenge yourself with high expectations, even if you don’t reach it, you will still reach something high, like the stars. 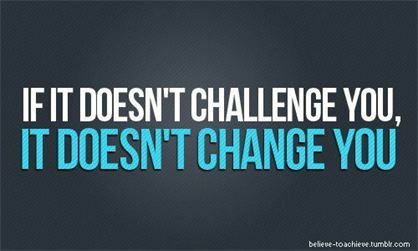 It is when you challenge yourself that you will continue to practice until you accomplish that challenge. My dream is to become a lawyer, to finish law school with flying colors and with honors. So how can I do that? From learning through experience. During my college years, I was always laid back, not studying, and never giving 100 % effort, but now that I have enrolled in law school, I challenged my self to improve my skills. For example, I look for seminars that would improve my personality, and I enrolled at the American Institute For English Proficiency (AIEP) to improve my writing skills, critical writing, and public speaking. One of the challenges that my mentor gave me was to write more, since the more I write, the more I will have the chance to see my strengths and weaknesses as a writer. Instead of complaining about the amount of writing I would have to do, I took it on as a challenge, which in turn, made me practice more and more. In times where we feel rusty and demotivated because of our performance, always remember that constant and deliberate practice will get you out of that rut you’re in. Just because we know how to do something doesn’t mean we should stop. Instead, keep sharpening your tools. Remember the three C’s to improve your practice: consistency, confidence, and challenge. There will be times when people doubt your skill, but because of practice, you can overcome these doubts and become confident in whatever you decide to do. We value character and personality, and it is the person who chooses to keep improving through practice who will ultimately become successful. I recommend that when we feel powerless, and we feel like we don’t have the skill or God-given talent, do something about it. ABOUT THE AUTHOR: Christian is a student at the American Institute for English Proficiency in Quezon City. He is on his way to becoming one of the best lawyers of the Philippines.